A lot of photographers have questions about file formats, color space, and bit depth. Who wouldn’t? The list of choices is overwhelming. It isn’t the sexiest topic in photography, but it’s critical to get it right. And it can be overwhelming trying to figure it all out. There are endless options. Thankfully, there are only a few that matter. There are a few scenarios to consider. The most important is your “working” files. This is the file process, and should be saved in a high-quality format. The other scenario is output. These files may be simpler, and often converted to a color space appropriate for the web or print. When you take your image beyond the RAW processing stage, you need to make a critical decision about what file format and settings to use. The most important choice is bit depth and color space. Getting either one wrong can result in loss of image quality. Your working file should always be 16-bit (unless you are working on an HDR image, in which case it would be 32-bit in Photoshop). The number of bits determine how smooth the transition is from one tone or color to the next. 8-bit is fine initially, but as you manipulate the image, the differences become more pronounced. Working in 16-bits protects you from problems like posterization or banding in clear skies. 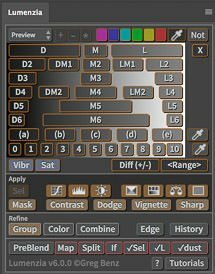 (Note that 8-bits tools are perfectly fine for luminosity masks and selections, it is only the image pixels that benefit from 16-bits). Color space is essentially the computer’s vocabulary for color. As a photographer, your work is almost certainly going to be in sRGB, Adobe RGB, or ProPhoto RGB. There are literally dozens (or hundreds) of books on this topic. But it boils down to this: sRGB is like using the vocabulary of a 5 year old, whereas AdobeRGB uses adult words, and ProPhoto RGB is like listening to a best-selling author tell a story. For your working/layered files, I recommend using ProPhoto RGB. It is so big enough to describe all the colors that can be created by the very best monitors and printers available. Adobe RGB is also a fine choice, but some high end printers have a larger gamut. One could make the argument to use a niche color space called eciRGB v2 (part of the European Color Initiative), but if you have any clue what that means, you don’t need to keep reading this article. Be sure to always check the option to “embed color profile” when saving. And finally, we need to choose the file format. There are only two that photographers need to know about: TIFF and PSB (also known as “Photoshop Big” and listed as “Large Document Format” in Photoshop). TIFF is an excellent choice because it can save all the information in your layered files, is widely compatible with most photography software, and supports files up to 4GB. I strongly recommend TIFF over PSD (which is not the same as PSB), because PSD offers no more compatibility/features and is limited to 2GB file sizes. When saving as a TIFF, you will be prompted with several choices. The only ones you should worry about are the image and layer compression settings. If you want to save files as quickly as possible, use None and RLE. If you want to make your files as small as possible, use ZIP for both (or at least ZIP for the layer compression, as that’s where you’ll save the most file size). PSB offers a couple of advantages over TIFF. It supports files of nearly any size (if you hit the limit, email me, I want to know what crazy project you’re working on). And it can create smaller files if you to to Preferences/File Handling and set “maximize PSD and PSB file compatibility” to NEVER. When compatibility is on, a flattened copy of the image is saved in the PSB file. If you work in Lightroom, you’ll need to use ALWAYS, as LR uses the flattened layer in the file. Note that Bridge works fine with NEVER. The main downside to PSB is that it is not yet supported by Lightroom. If support for PSB were added to Lightroom, I would stop using TIF entirely. The 4GB limit is something I run into probably 25% of the time, so it’s a real problem when you work with layered or high-resolution images. Just creating a flattened file for a 40×60″ 300dpi print and converting it to a Smart Object for sharpening will blow past the 4GB limit. With high-resolution camera, blended exposures, and layer masks, it is already common to hit the limit without resizing the image. 8-bits is ideal for sharing on the web. The benefit of 16-bits is really only during editing (except for some high-end niche monitors), and JPG only supports 8-bits anyway. But this should always be the last step. The 8-bit file should be saved separately from your working file. Never convert your working file to 8-bits. sRGB does not have nearly the color detail of ProPhoto. As a result, you can get out of gamut colors and other color problems. In an ideal world, we’d all just use a larger gamut like ProPhoto all the time, but many web browsers and computers are not properly designed to understand anything other than sRGB. So when you are sharing your document on the web or over email, convert the image to sRGB. But only do this for the exported image. Never convert your working file to sRGB. The main file format for photographers is JPG. It creates vastly smaller file sizes that look indistinguishable from the working file. However, JPG does not support transparency. If you are cutting out a product or subject from a background and want to use transparency, save the image as a PNG.